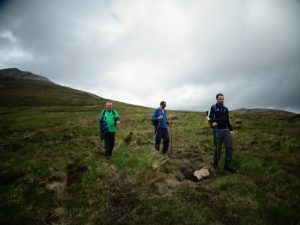 On Saturday 20th May 2017, blessed with glorious sunshine, Donegal Civil Defence along with members of Cavan, Leitrim, Sligo and Tipperary Civil Defence, supported by first aid, rescue, welfare and radio communication teams, took on the challenge of climbing Errigal Mountain, a (2,464 ft) mountain near Gweedore in County Donegal. 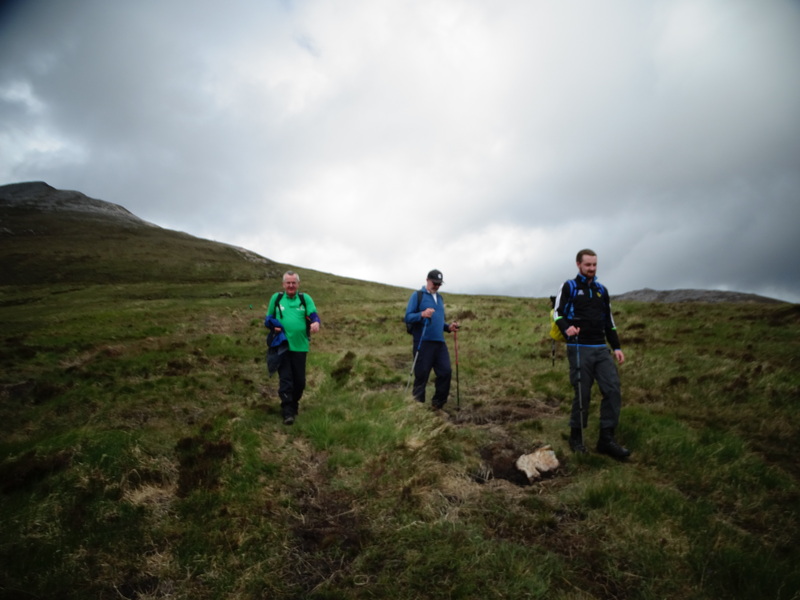 It is the tallest peak of the Derryveagh Mountains in Co. Donegal, and the 76th tallest peak in Ireland. 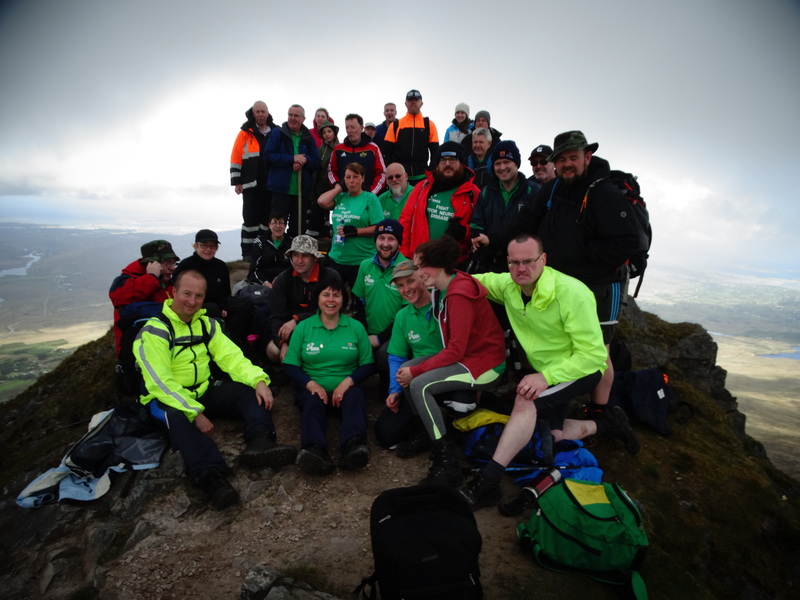 The sponsored climb was held in aid of The Irish Motor Neurone Disease Association ( IMNDA). 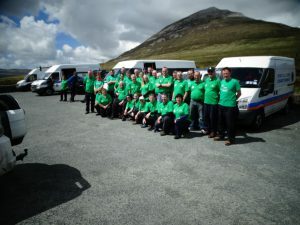 31 climbers in total, braved the challenge to raise much needed funds for the IMNDA following the diagnosis of one of Donegal’s long serving members and friends within the organisation, Mr. John Cunningham, Carndonagh, who has been diagnosed with Motor Neurone Disease in recent years. John joined Civil Defence on 15th February 2007 and has been an active member ever since. Since joining, John has been a significant role model for young and the not so young, within the Auxiliary Fire Service (AFS). He worked hard at setting up of the AFS station in Carndonagh, has worked alongside the Donegal Fire Service at gorse fires and was a member of the winning National Civil Defence AFS Pump Drill Team in 2008. Despite his diagnosis, John continues as a member of Civil Defence and continues to give valuable service to his community in any way possible. Motor Neurone Disease is a neurological condition that does not discriminate, striking people of all ages. There is currently no treatment or cure. The damage caused by MND is progressive so it gets worse over time. MN is a debilitating disease which requires further funding and research. It is with this in mind that Donegal Civil Defence decided, after seeing at first hand the effects it can have on a person’s quality of life, to fundraise in an effort to support continued research. On Friday 15th July Donegal Civil Defence presented Ms. Lorna Given – IMNDA with a cheque for €4,856.50 – proceeds from the event at a function held in the Civil Defence Headquarters, Stranorlar. 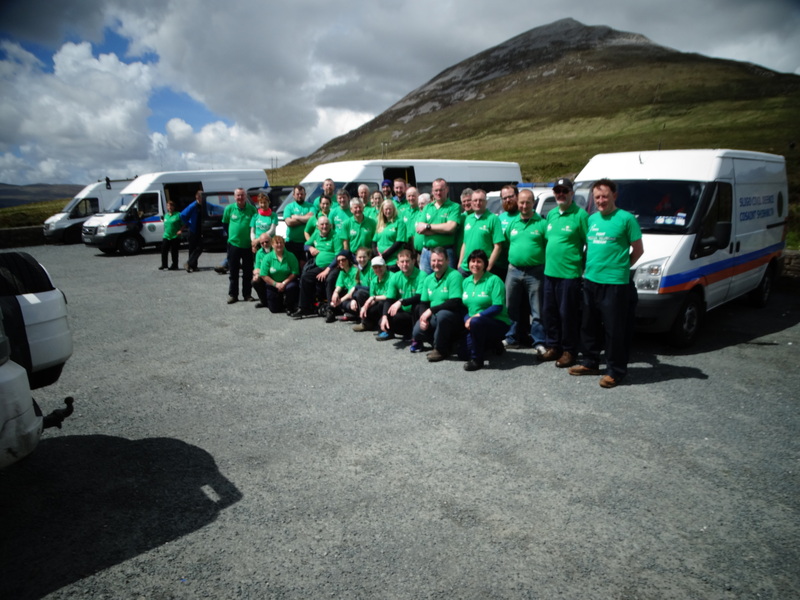 Donegal Civil Defence would like to thank all the climbers and helpers on the day especially those who travelled long distances to support the event, those who donated to the very worthy cause, the incredible sum raised would not have been possible without such generosity. A special message of gratitude is due to John Cunningham and his wife Thelma, for allowing Civil Defence colleagues the opportunity to raise the funds in John’s honour. A special acknowledgment to Jackie McCrudden and Conor McCrudden who supported the climbers with Radio Communications, First Aid and the very welcome cup of tea when the climbers came down and Leno Da Silva who provided all the camera work on the day. Tipperary: (Malachy Colison, Brian Ely, PJ Graham, Shane Kerwick, Gary Shanahan).